Quality Air Heating and Air Conditioning > Articles > Air Conditioning > How Do Geothermal Air Conditioners Work? How Do Geothermal Air Conditioners Work? The term “geothermal heating” is now generally familiar. But the idea of using geothermal power to provide cooling might seem a bit strange, perhaps even counter-intuitive. However, using the mechanics of a geothermal heat pump (also known as a ground-source heat pump for reasons we will get into below), you can use the stable, clean, and renewable energy of the earth to cool down your home during summer. We’ll provide a brief explanation for how this works. Installing a geothermal heat pump requires trained technicians and an extensive amount of labor that falls far outside the ability of amateurs. 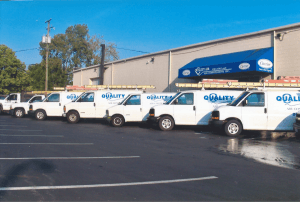 When you think that geothermal air conditioning in Columbus, OH is in your future, contact Quality Air Heating and Air Conditioning, where installing and caring for geothermal power systems is one of our basic professional services. A geothermal comfort system is a type of heat pump: it moves heat from one location and places it in another. By reversing the direction it moves refrigerant, it can reverses the direction the heat moves. In one mode, heat is moved inside and you have heating. In another, heat is moved outside and you have cooling. A standard heat pump is an air-source pump that uses the air for its medium of exchange. It extracts heat from the outside air and moves it into a house, or it extracts heat from inside a house and moves it outside. But a geothermal heat pump is ground-source: it uses the earth as its medium of exchange, removing heat from it during heating mode and depositing heat into it in cooling mode. The indoor parts of a geothermal heat pump are similar to an air-source heat pump. The difference lays in the outdoor ground loops. These refrigerant lines are buried in the property around a house, either in horizontal or vertical configurations (depending on how much space is available). Some systems use chemical refrigerant to run through the pipes, but the majority circulate water. The temperature of the earth at the depth of the coils remains stable at around 55°F regardless of the surface temperature—this makes it ideal for air conditioning. It’s easy for the indoor coils to remove heat from thenhouse—which is probably above 80°F—and move it into the cooler ground. When the winter comes, the still stable 55°F is a ready source for heating. The major drawback of a geothermal heat pump is that it isn’t ideal for all properties. The loops require significant space and the land itself may not be a good heat source. And although geothermal heat pumps cost less to run than most heating and cooling systems, they do have a larger initial cost. Call Quality Air Heating and Air Conditioning to talk to one of our experienced geothermal installers. You’ll soon find out if you can use a geothermal heat pump for your air conditioning in Columbus, OH.